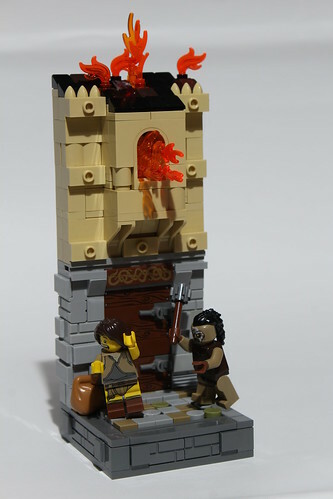 Classic-Castle.com • View topic - [MOC] CCCXV - When the War knocks to your home. [MOC] CCCXV - When the War knocks to your home. I'm glad to show you my second entry for Castle Vignette category in 15th CCC. Sadly, I can't really say that I like this build by myself. I was struggling with it for 3 weeks, mainly because of lack of time and lots of school things. Although I hope you guys like it. There is still some stuff from me to come! If I finish something before the deadline. Re: [MOC] CCCXV - When the War knocks to your home. Great use of the printed tile over the door, and the street's cobblestone design is very effective. All the textures and surfaces look rugged and real! Well done. Don't just stand there, peasant, run from the orc!